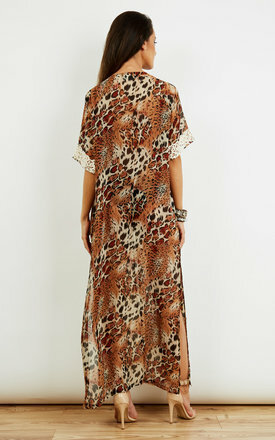 This kaftan is perfect for your Summer holiday. Silk chiffon with crochet front and bell sleeze. Loosley fitted with high front split and sides splits. Wear over your swim suit or slip from day to night. Dress it up with heels or dress down with gladiator sandals. Also reversible.